Bolchazy-Carducci: Yes, Virginia, there is a Santa Claus…in Latin! : Vere, Virginia, Sanctus Nicolaus est! Virginia O'Hanlon's earnest question set New York Sun editor Francis Pharcellus Church to writing. Church's reply, a testimony to the existence of Santa Claus, on the marvels of the unseen but very real world of wonder, are now a part of Christmas lore. This edition offers a translation into Latin of the text of Church's well-known editorial. The Latin text is handsomely scripted and charmingly illustrated. On September 20, 1897 Francis Pharcellus Church, an editorialist for the New York Sun, was handed a leter by the 8 year old Virginia O'Hanlon, a New York City girl who, troubled by her friends' assertion that Santa Claus did not exist and on her father's advice, had sought the truth from her family's favorite newspaper. The editorial, which appeared the next day-paradoxically, three months before the appropriate time--became universally known and was later published separately. The present book offers a bilingual edition of the text. The Latin translation, by Walter Sauer and Hermann Wiegand, appears twice: by itself, formatted as folios of a manuscript (pp 1--13), and together with the same-page English original (pp14--20). In the first, totally Latin part, the body of the text and the decorated initials represent a mixture of scripts, based on medieval models: mainly textualis, but also some square capitals, uncials, and rustic capitals, a feature which contributes toward the translator's own innovative style. After the second, English-Latin part, there is a two-page Latin-English glossary of words that may be unknown to readers with less Latin. This translation belongs to the trandition of rendering into Latin important books written in the vernacular, from Dante's Divina Commedia to Macchiavelli's II principe, from the Icelandic Edda to the Finnish Kalevala, from the Fables of LaFontaine to Goethe's Faust. Children's books have also had their place among the translations in the language of the res publica litterarum, although some of them have suffered by translation into poor and artificial Latin (on this see J. IJsewijn and D. Sacre, Companion to Neo-Latin Studies (Leuven, 1998), 2:24.5)., Among the noted children's books we may recall Pinoculus of H. Maffacini (Pinocchio), A. Lenard's Winne Ille Pu (Winnie the Pooh), Regulus of A. Haury (Le petit prince), Alicia in terra mirabili of C. H. Carruthers (Alice in Wonderland) (if the latter two are realy children's books), and the recent translations of J. Tunberg and T. Tunberg: Quomodo Invidiousulus nomine Grinchus natalem Christi Abrogaverit (How The Grinch Stole Christmas) and Cattus Petasatus (The Cat in the Hat). Such books have a place in the Latin heritage of the Western civilization, but they can also be used as a powerful didactic instrument. By approaching through Latin the archetypes of their childhood, students may create their own shortcuts towards undersanding Latin and more easily internalize a language that for all too many remains external. Furthermore, some of these translations go far beyond the original and proclaim their own life in the new language. Vere Virginia, Sanctus Nicolaus est! contains two letters: the short inquiry of Virginia, and the longer reply of Franciscus P. Church, the latter one being really a treatise in epistolary form. The language used in the one of philosophical and moral discourse. Some of the monosyllabic sentence endings chould be shifted within the sentence to preserve a better Latin rhythm (as in the title Vere, Virginia, Sanctus Nicolaus est!). In favor of a genuine Latin sentence-structure, the vocatives could be moved from the very beginning to second or third position, e.g., on p. 4: Cara Virginia, affirmare ausim amicos tuos parvulos errare, could become Affirmare ausim, cara Virginia, amicos tuos parvulos errare. Also, the name of the sender, alreqady incorporated in the initial greeting, may be omitted at the end of the letters so that Bene vale is the conclusion of the letter (p. 13). Vere, Virginia, Sanctus Nicolaus est! would be a lovely touch of sophisticaion ounder the Christmas tree (a Christmas memories journal is included, hopefully to be composed in Latin! ), but also an addition to the livrary of anyone collecting the complete Latin tradition throughout the centuries up to our days. 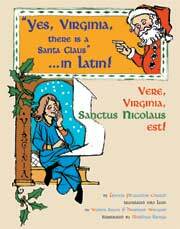 Yes, Virginia, There Is A Santa Claus - In Latin! Francis Pharcellus Church Bolchazy-Carducci Publishers 1000 Brown St., Unit 101, Wauconda, IL 60084 0-86516506-8 $14.95 bolchazy.com It's going to be hard to peg this but small but elegant picturebook, which looks like a child's reader but contains an all-Latin version of Church's story, translated by Walter Sauer and Hermann Wiegand and illustrated by Matthias Kringe. Suffice it to say that students of Latin - of all ages - will find Yes, Virginia, There Is A Santa Claus - In Latin! both whimsical and a challenge to a student's elementary-level Latin knowledge. A fun little book.